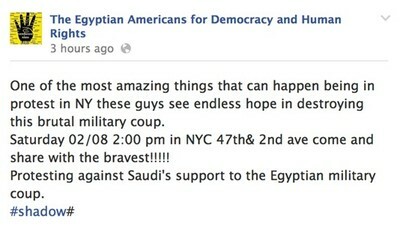 IPT Video Report: NYC Pro-Morsi Rally Blasts Saudis as "Dirtier Than Jews"
The EADHR issued a statement Tuesday distancing the organization from the rally. "This was not a national EADHR approved event and the actions of these individuals do not represent the organization," it said. The group "stands for civil liberties and equality for all human beings, regardless of ethnicity or religion. EADHR stands for open dialogue as a means to conflict resolution, economic and social justice, and political cooperation." That statement doesn't fully jibe with these promotions from EADHR's Twitter feed. The group Egyptian Americans for Democracy and Human Rights (EADHR) has organized rallies throughout the country since last summer, demanding Muslim Brotherhood politician Mohamed Morsi be reinstated as Egypt's president. Those rallies normally showed a degree of discipline, with chants calling for democracy and expressing love of Morsi himself, with the Muslim Brotherhood going unmentioned. A Feb. 8 rally outside the Saudi Arabian consulate in New York City didn't focus on the Islamist group, either. But chants and speeches in Arabic blamed the Saudis for Egypt's political situation, with some calling on God to destroy the Saudi regime, and allegations they are trying to "sell Egypt to the Jews."